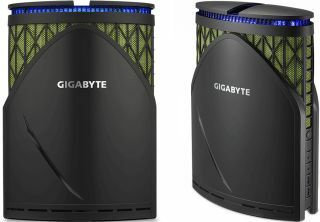 Gigabyte has added a couple of new compact Brix systems to its lineup, both of which pack an impressive arsenal of hardware in a chimney-style chassis that measures 276mm x 384mm x 128mm. That's about as tall and wide as a small office trash can, but much narrower and not filled with junk. There are two configurations to choose from. The first is the GB-GZ1DTi7-1080-OK-GW, which as the model number suggests is built around a Gigabyte GeForce GTX 1080 Gaming G1 graphics card with 8GB of GDDR5 memory. Gigabyte paired it with an Intel Core i7-6700K processor and stuffed 32GB of DDR4 memory inside. A 240GB M.2 SSD handles primary storage duties while a 1TB HDD (7,200 RPM) occupies the chassis bulk storage. Powering all of the hardware is a custom designed 400W PSU. Other features include 802.11ac Wi-Fi, GbE LAN (Killer E2400), three USB 3.0 Type-A ports, a single USB 3.1 Type-A port, a single USB Type-C port (USB 3.1/Thunderbolt), and separate headphone and microphone jacks. Gigabyte's other model is the GB-GZ1DTi7-1070-NK-GW with the same general hardware and features, except that it wields a GeForce GTX 1070 Gaming G1 graphics card and half the amount of RAM at 16GB. Everything else is the same. These are intended to be high-end gaming desktops capable of playing at a 4K resolution or with a VR headset. They could also be used as portable desktops for LAN parties or for bringing a VR headset to a friend's house. We haven't tested one of these in person, though one of our concerns about the chimney design is airflow. Things looked pretty cramped inside, and though the graphics cards each have three fans, they're not blower-style coolers. Instead, Gigabyte is relying on natural airflow and air pressure to direct hot air towards the top where a pair of vents open up as needed. Presumably Gigabyte did its research here and concluded it's a sound design, but until we test one ourselves, we can't definitively say if heat buildup is a problem. Other than that, it is an interesting setup, especially if you're looking to plop a PC in the living room. Gigabyte did not say when its new Brix configurations will be available to purchase or how much they will cost.